The chancellor’s use of language in this afternoon’s Budget was patronising at best. Schools are facing real cuts and making real redundancies, writes Ed Dorrell at TES. Some reflections: – As schools are being asked to deliver more and more and following recent Headteacher and FE sector protests in Parliament the government is missing the message. How are schools expected to deliver on the Gatsby principles when the Chancellor hands that little extra to buy white boards etc (as he stated on the BBC Breakfast when interviewed this morning)? I felt sorry for education secretary Damian Hinds this afternoon as the chancellor delivered his budget. Perhaps we should have known something was up, because as the cabinet ushered themselves in to hear “Fiscal” Philip Hammond deliver his annual set-piece, Hinds chose not to find a spot on the frontbench. In reality – despite years of biting cuts in schools – nobody expected there to be big bucks set aside for education, despite the prime minister announcing the “end of austerity” last month. The billions had already been promised to the NHS. So it was slightly surprising when Hammond announced that he’d magicked £400 million extra as a one-off in-year funding boost for schools. This, he told us, would be roughly equivalent to £50K per secondary and £10K per primary. This cash, Hammond explained, would help schools to “buy the little extras they need; a one-off capital payment”. He said the government was “investing record amounts in our schools”, but acknowledged that “schools’ budgets do not stretch to that extra bit of kit that would make such a difference”. This was, at best, a staggeringly tone-deaf bit of speech writing. To heads and teachers who have suffered years of real-terms cuts – and the redundancies that have followed – “help with the little extras” was an extraordinary thing to say. Many of the early reactions from teachers on social media and from teachers’ representatives correctly described the use of the phrase as “insulting”. What on earth does Hammond think has been happening to education spending in the past few years? Hinds and his team have done much to attempt to reach out to the profession (admittedly with mixed results and with very little in terms of extra funding). 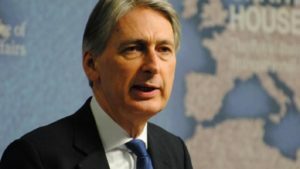 To see the chancellor explaining, smilingly and patronisingly, that these pitifully small amounts of cash would help schools to resolve their finances must have been almost as galling for the education secretary as it was for the thousands of teachers who suffered a collective jaw-drop. “Incredulous” doesn’t do the reaction justice.